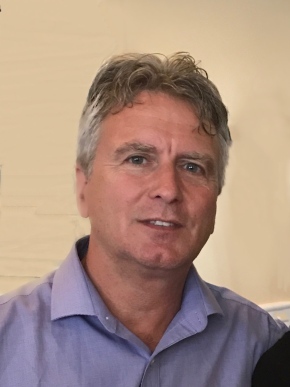 In Memory of Stephen L. Simmons, Jr.
Stephen L Simmons, 58, of Warwick, NY and Chatham, MA passed away peacefully on Wednesday, March 20, 2019. Surrounded by loved ones, he lost his life to glioblastoma at Villa Marie Claire in Saddle River, NJ. Steve was a graduate of Park Ridge High School, Penn State University, and Suffolk Law School. Stephen, a gentle soul, was a talented and artistic man who was brilliantly clever, quirkily funny, and humbly generous. He enjoyed driving in his 1971 Cutlass convertible, navigating his boat, snowmobiling in Canada, golfing, and spending time with family and friends. Stephen, predeceased by his parents Stephen Simmons Sr. and Roberta ‘Bobbi’ Miller, is survived by his devoted wife Karen (nee Humphris), daughter Kelsey Simmons and son Trevor Simmons, of Warwick, NY. He is also survived by his sisters and their spouses, Karyn and Dave Spence of Mooresville, NC and Donna and Gerry Sittmann of Morris Plains, NJ and brother and spouse, William and Silke Miller of Harvard, MA, as well as many loving nieces and nephews. In lieu of flowers, donations may be made to Charity Water (www.charitywater.org/donate), Habitat for Humanity, 25 Orchard Street, Middletown, NY 10940; or Villa Marie Claire, 12 West Saddle River Road, Saddle River, NJ 07458. Memorial visitation on Saturday, April 20, 2019 from 2-4 pm followed by a memorial service at 4:00 pm at the Mulder Chapel, 62 Warwick Center Road, Warwick, NY. At the time of funeral service we commemorate and reflect on the life of Stephen L. Simmons, Jr.. In the days, weeks and months ahead it will be a comfort to family of Stephen L. Simmons, Jr. to continue to remember a life well lived. Please select a date on the Calendar of Care to be reminded via email to reach out and continue the caring for family of Stephen L..